The aim of this blog is to allow you to keep up to date with the latest and grates functionalites that are coing up or available in www.linqto.me - the online bookmarking engine. ← In 2018 Linqto.me has gone mobile! In part one of this article we looked at how you can install and use the Linqto Bookmarklet to easily add bookmarks directly from the pages you are browsing to your www.linqto.me account. If you are using the Internet Explorer browser, you may also use the Accelerator feature to bookmark pages as you browse. Make sure to check the 'Make this my default provider for this Accelerator category' checkbox to make this accelerator the default one in the tools category, and have it be displayed directly in the context menu for accelerators. Once the accelerator is installed, you can just right click any part of a page you are navigating on, and you will immediately see the context menu displayed by Internet Explorer. Select the Linqto.me Accelerator menu item, and this will open a new window where the url of the page you are browsing and the title will be automatically captured. You may also provide other details such as a description or keywords to help you when searching for the bookmark later. You may also directly save the bookmark and allow www.linqto.me to generate the rest of the data on the bookmark by examining the page. 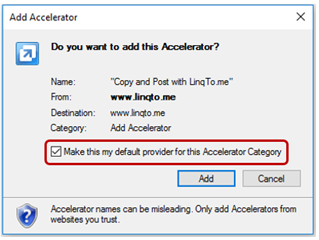 If you select a piece of text from the page you currently accessing, and then right click and access the Linqto.me Accelerator as described above, the selected text from the page will be captured in the bookmark description field. This will allow you to provide information on the bookmark to be saved even faster. 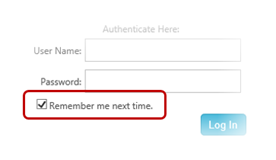 Like with the bookmarklet, remember to also tick the 'Remember me' check box when logging on to www.linqto.me before attempting to use the accelarator, as this will allow the system to authenticate you when you attempt bookmark a page. Happy bookmarking in the Cloud.